“From that time Jesus began to show to His disciples that He must go to Jerusalem, and suffer many things from the elders and chief priests and scribes, and be killed, and be raised the third day. 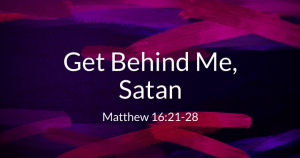 Then Peter took Him aside and began to rebuke Him, saying, ‘Far be it from You, Lord; this shall not happen to You!’ But He turned and said to Peter, ‘Get behind Me, Satan! You are an offense to Me, for you are not mindful of the things of God, but the things of men’” (Matthew 16:21-23 – NKJV). At first reading, we might think that Jesus’ reply to Peter seems harsh. After all, Peter loved and revered Jesus — he had plainly confessed his faith in Jesus as the Christ. The very idea that someone would harm Jesus, much less kill Him, was unthinkable to Peter. He was willing to take up arms (John 18:10) and even sacrifice his own life (Matthew 26:35) to prevent any aggression against the Son of God. Most of us would be delighted to have someone as concerned for our well-being. Why then does Jesus upbraid Peter so sharply, calling him “an offense,” even referring to the apostle metaphorically as “Satan”? (Matthew 16:23 – NKJV). Jesus did not deny Peter’s love for Him, but He recognized that love, to a certain degree, was a selfish one. After listening to the teachings of Jesus for three years, one would think that Peter would have understood God’s plan and purpose in sending His Son required His death as a sacrifice for the sins of others. Even if that fact were not entirely clear to the apostle, something else should have been — if the Lord said something had to happen in order for His will to be accomplished — that was exactly the way it had to happen (cf. Isaiah 55:10-11 – NKJV). There could be no room for argument, compromise, or second-guessing. There’s no question that Peter believed in Jesus’ mission (Matthew 10:5-6 – NKJV; cf. Matthew 15:24; Matthew 18:11; Luke 19:10), but he wanted to see that mission accomplished on terms suitable to him. He desired salvation, but he didn’t want Jesus to suffer and die to make that salvation possible — even if God said it was necessary (Hebrews 10:5-10 – NKJV; cf. Psalm 40:6-8 – NKJV; Matthew 26:39 – NKJV; John 4:34 – NKJV; John 5:30 – NKJV; John 6:38 – NKJV). Peter’s motivation to preserve the life of the Lord he so loved, would seem noble in our eyes. However, Jesus wanted him to understand that no motive is noble if it conflicts with God’s divine plan! In today’s so-called religious world, we see many folks who are mindful of the things of men rather than of God. Their motives often appear worthwhile because they say they do not want anyone to be lost. However, they tell folks their sins are forgiven and their souls saved when they have not obeyed God’s commands of repentance and baptism (Mark 16:16; Acts 2:38; 1 Peter 3:21). Focusing only on the happiness of people, they offer them worldly diversions, even though these things are not according to God’s will (Colossians 2:18-23 – NKJV). They want people to attend church services, so they make worship an attractive spectacle instead of humble obeisance to the Lord (John 4:24 – NKJV; 1 Corinthians 10:31 – NKJV; Colossians 3:16-17 – NKJV; cf. Micah 6:8 – NKJV; 1 Samuel 15:22 – NKJV). They don’t want to offend anyone, so they permit women to lead in worship despite God’s prohibitions in that regard (1 Corinthians 14:34-38; 1 Timothy 2:11-12) and justify those who unrepentantly engage in immorality (1 Corinthians 6:9-10; Galatians 5:19-21). Jesus’ words to Peter prove that even the most sincere individual can be sincerely wrong when that sincerity is not fully subject to God’s will. Peter’s love for Jesus could not be permitted to supplant the Father’s righteous plan for mankind’s salvation (cf. 1 Corinthians 2:7-8 – NKJV). We would be wise to learn from Peter’s error, and remember that God’s work can only be done God’s way (Matthew 7:21-23), lest He say to us, “Get behind Me, Satan!” (Matthew 16:23 – NKJV). Thanks so much to the best towing company in St. Petersburg for sponsoring my blog.